G-Shock Asia has a new catalog available. 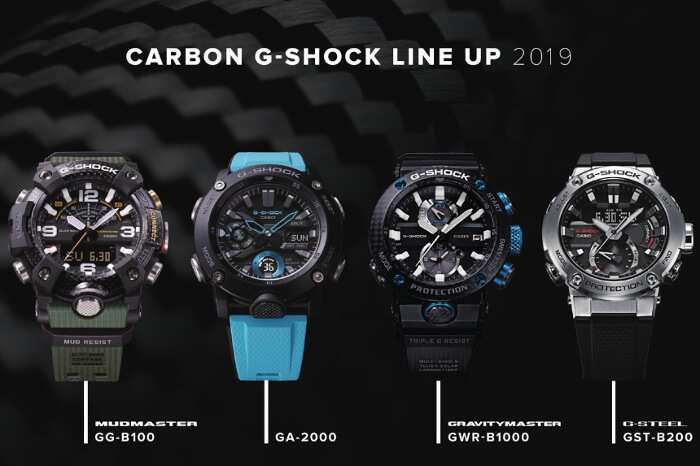 The G-Shock x Carbon catalog showcases the four new Carbon Core Guard models: Mudmaster GG-B100 (July 2019, August 2019 US), GA-2000 (March 2019, May 2019 US), Gravitymaster GWR-B1000 (March 2019), and G-STEEL GST-B200 (May 2019). The G-Shock x Carbon catalog is available at world.g-shock.com to view online or download as a PDF file. When will there be a carbon successor to the G-SHOCK GPW-2000-1A2ER. This is the watch I am really waiting for! Radio-controlled, GPS, Bluetooth and made with carbon!